Sometimes referred to as a "belly button problem," a leakage in the area of a new foal's umbilicus is a cause for concern. 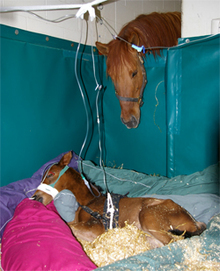 Although slight leakage may occur in foals up to approximately 7 days old, when the foal's urachus doesn't seal off properly, it becomes a major concern. Closely monitoring a foal's navel during the first few weeks of life for signs of moisture, enlargement, or urine leakage is important to assure an early diagnosis. Navel infections in foals can become life threatening if immediate action is not taken and the infection is allowed to spread through the bloodstream. The condition known as patent urachus is a leakage in the area of a new foal's umbilicus and when the urachus does not seal off properly within a few days of foaling, it becomes a major concern that requires immediate medical attention. The umbilical cord is a 20-40 inches cord that connects the placenta and the fetus. Its primary purpose is to serve as a conduit for the inflow of nutrients and outflow of waste products from the fetus. The structures in the umbilical cord are the two umbilical arteries and single umbilical vein and the urachus. The urachus is the tube within the umbilical cord through which urine from the unborn foal travels from its bladder to the allantois, the fluid filled sac surrounding the unborn foal. At, or not long after birth, the umbilical cord ruptures spontaneously as a result of the movement of the foal or mare and the structures within normally seal off. 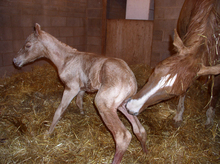 The point of rupture is a place approximately Â¼ inch from the foal's body. Normally, the urachus closes at the time of birth and the navel dries and shrivels up within hours of birth. When the urachus does not close, it is considered persistent urachus. When the urachus closes and re-opens at a later date, it is known as patent urachus. The veterinarian may decide to cauterize the congenital patent urachus and in most cases, the foal will need to be removed to an animal hospital for necessary treatment. Inadequate closure of any of these structures creates the potential for bacteria from the external environment to enter the foal causing a hematogenous, or blood derived, infection. Because of this, it has become a common practice to dip the navel and cleanse the area with a chlorhexidine solution in hopes of warding off potential infections. In either case, urine continues to leak from the umbilicus. The amount of leaking urine varies considerably, ranging from an occasional drip and a moist navel, to full streams of urine. The degree of patency varies from an occasional drip to full streams of urine from the navel when the foal urinates. Closely monitor your foal's navel in the first few weeks of life for any signs of moisture, enlargement or urine leakage. Dip your foal's navel with chlorhexidine or a dilute iodine solution at the time of birth and several times over the next 24 hours. It is important for your foal to receive adequate colostrum to ensure that it has the required immunity to help fight infection. A more serious complication of a patent urachus stems from the fact that a patent urachus provides an environment favorable for bacterial infection. This infection can spread through the bloodstream and can lead to life threatening complications such as joint infection, pneumonia and generalized septicemia. Advanced infection of the urachus or navel and involvement of other body systems greatly decreases the chance of survival. An ultrasound examination by a veterinarian will help confirm communication between the bladder and the urachus and help determine the presence and extent of infection and the structures involved. Other less common complications include bladder infection, bladder wall necrosis and abdominal adhesions. Despite diligent disinfection and because many foalings occur unsupervised, it is not uncommon for foals to develop problems with their umbilicus. This is usually seen one to ten days after birth. A patent urachus occurs more commonly in foals that strain to defecate because of meconium impactions or with premature umbilical cord separation. It has been suggested that partial twisting of the umbilical cord in the womb, or a greater than average length of umbilicus, may lead to dilation of the urachal tube and subsequent failure to close at birth. A patent urachus can also be acquired within the first few weeks of life, even after the urachus originally appeared to have sealed at birth. This type of patent urachus is most commonly associated with a navel infection. Patent urachus can also be caused by the foal straining (e.g. in the case of constipation) or by lifting the foal under the abdomen. Debilitated and systemically ill foals are most at risk for developing a patent urachus. A veterinarian will do an examination, including an ultrasound of the foal's navel to confirm patency between the bladder and the urachus, and blood tests will help determine the extent of infection to help the veterinarian decide on appropriate antibiotic therapy. Debilitated or ill foals are at risk for developing this condition. Since patent urachus may serve as a source of systemic infection, a veterinarian needs to be called in to diagnose the problem and correct it as soon as possible. 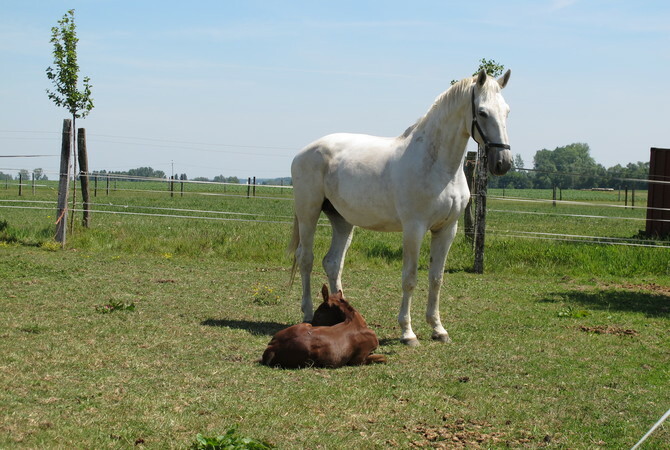 A veterinarian will do a thorough examination, including an ultrasound of the foal's navel to confirm patency between the bladder and the urachus. Blood tests will help determine the extent of infection, and bacterial cultures of the navel will help the veterinarian decide on appropriate antibiotic therapy for the foal. In addition to antibiotic therapy, the veterinarian should determine whether chemical cauterizing or surgical means to close the urachus will work best to correct the condition. Surgery to remove the infected navel structures may be necessary, and closing the opening between the urachus and the bladder will be done under general anesthesia. In some cases, the veterinarian may decide to cauterize the congenital patent urachus. In most cases, the foal will need to be removed to an animal hospital. Following surgery or cauterization, the foal will need to remain at rest for several days with antibiotic treatments continuing until all danger of infection has passed. Restricted activity for several weeks in a clean stall will help with the healing process. Mild complications, such as urine scalding and dermatitis, that result from patent urachus should also be treated under the guidance of a veterinarian. The prognosis for a persistent urachus is excellent in most cases, and the prognosis is good in cases of acquired patent urachus with associated navel infection when early diagnosis is made with prompt medical and surgical treatment. Advanced infection and spread of infection through the bloodstream greatly reduce the chance of survival and the prognosis is guarded.